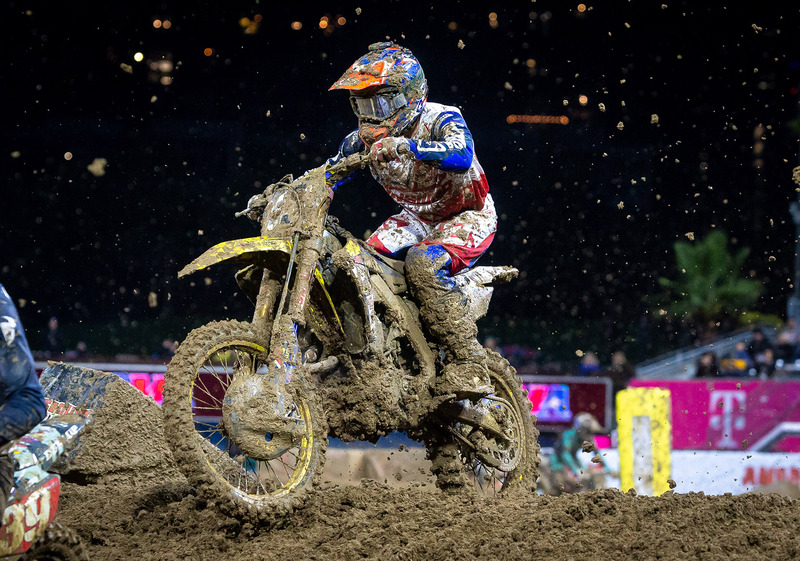 Despite the crazy, muddy conditions, JE Pistons-sponsored riders took all 3 steps of the 250SX podium Saturday night in San Diego. Check out the insane conditions and what the riders thought here. Official release from JE Pistons. 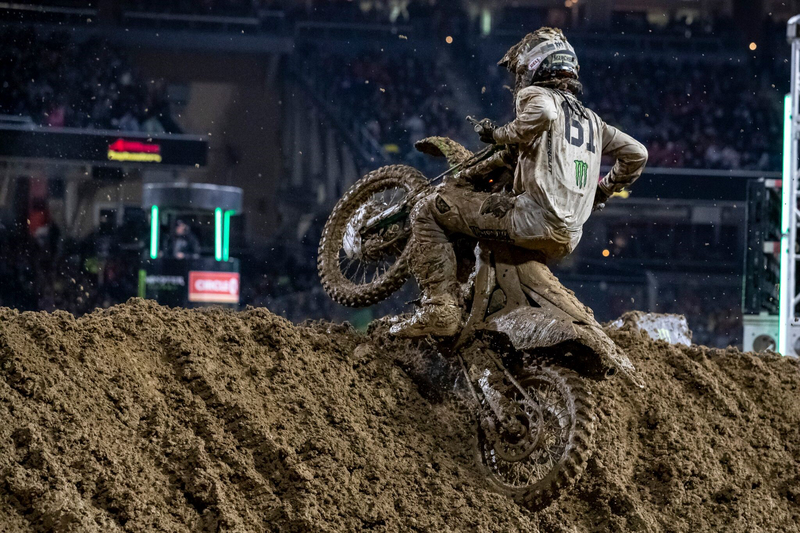 SAN DIEGO (February 4, 2019) – In a beautiful exercise of contradictions, Adam Cianciarulo, Garrett Marchbanks and Jimmy Decotis pulled off the clean sweep in the ugliest of conditions as the JE Pistons-sponsored trio swept the top three spots in Monster Energy AMA Supercross, a FIM World Championship, Western Regional 250SX Class action Saturday night. If conditions at a typical Supercross aren’t challenging enough, monsoon-like rains added an unpredictability factor in San Diego that had yet to been seen in 2019. 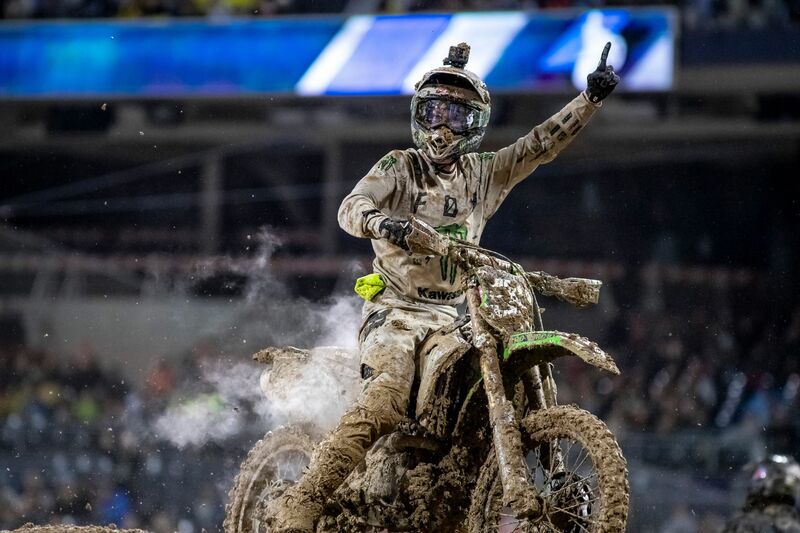 While mud races tend to yield surprise winners, Cianciarulo spoiled any potential bombshells by grabbing the holeshot on the way to his third victory in five races, and second straight. For the second straight weekend, AC led the main event from flag-to-flag. At the same time and also for the second weekend in a row, Cianciarulo led the 250SX Class main event from flag-to-flag to pick up the win, but this time, the rider of the No. 92 Kawasaki KX250 took the division’s point lead to the top step of the podium with him. As a result, the New Smyrna, Fla., rider will showcase the red number plate signifying series points leader when the Western Regional 250SX Class returns to the track next month in Atlanta. Adam will be returning to the next West round of Supercross with the red plate. "What a night,” commented Cianciarulo. “It feels good to go into the break with the win and kind of put the mind at ease, a little bit. I don’t think I’ve had the red plate since I was a little kid so that feels good, too. When you have a stressful day like we did, with all the mud, it creates a lot of unknowns. There’s a lot of stuff that can happen that is out of your control so to get this win feels better than usual. I’m excited to keep building on this. We’re halfway through (the Western Regional 250SX Class schedule) and we’ve got a couple of weeks before we go back to work so I’m excited. It has been an up and down first several weeks of racing for me, but to get this win is huge. I also want to give a shout out to my teammate Garrett Marchbanks on his first ever podium. 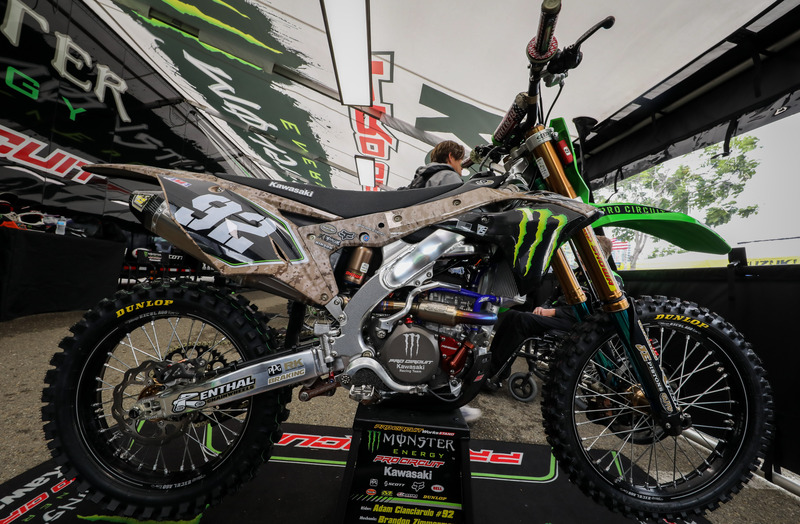 It was awesome to have the Monster Energy/Pro Circuit/Kawasaki team go 1-2 in San Diego." 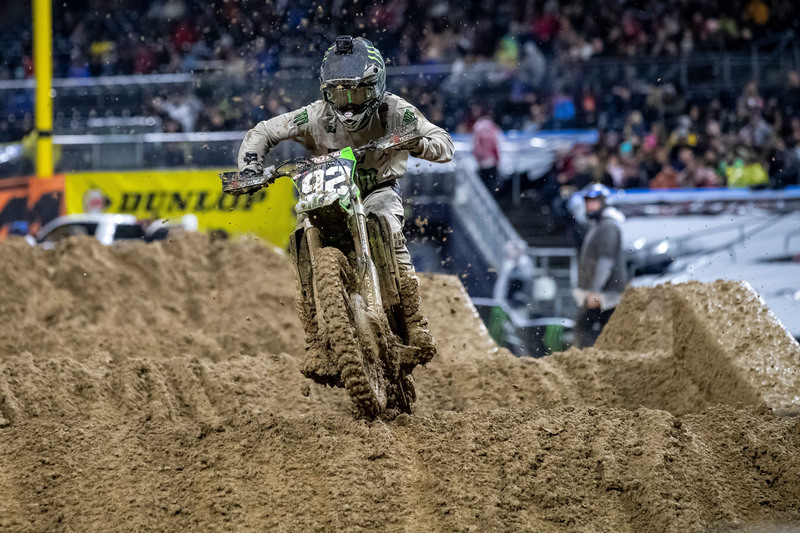 Marchbanks’ appointment to the Pro Circuit squad late last year proved to be with plenty of merit Saturday night as the Supercross rookie charged to a second-place showing and first podium finish as a professional. Despite having to ditch his goggles by lap 2, Marchbanks charged through the conditions for his career-first podium finish. JGRMX/Yoshimura/Suzuki Factory Racing’s Decotis put the icing on the cake with his top-three effort, matching his career-best finish while rewarding JE with a muddy, but, clean sweep of the podium. Jimmy-D had a blast riding his JE-powered RM-Z250 through the muddy conditions, and it was evident in his 3rd place finish. On the senior circuit, in the 450 paddock, JGRMX’s Chad Reed rode his JE-sponsored Suzuki RM-Z450 to a season best fifth-place finish. Monster Energy AMA Supercross will trade the friendly confines of southern California for the heart of winter in the Midwest this weekend when the series returns to U.S. Bank Stadium in downtown Minneapolis. The sixth of 17 races on the 2019 schedule will be televised live on NBCSN Sat., February, 9 beginning at 8 p.m. Eastern Standard Time, 5 p.m. Pacific.